Compounded medications are available to help with all of the above problems. We work closely with practitioners and caregivers to customize a personal solution that meets the needs of each patient so that patients can enjoy precious time with loved ones. Please contact our compounding pharmacist to discuss the dosage form, strength, and medication or combination that is most appropriate. Among the greatest therapeutic challenges faced by both patients and caregivers is the treatment required by individuals who have a terminal condition. It is difficult to find evidence-based studies on the management of end-of-life situations because each patient’s medical case is unique. In addition, maintaining a controlled environment for such patients is difficult. End-of-life care is multifaceted and people with a terminal illness are among the most vulnerable patients in need of effective and compassionate care. When those patients suffer in spite of commercially available therapies, the innovation and experience of clinicians and compounding pharmacists can often yield a solution to the most challenging treatment problems. Int J Pharm Compd. 2014 May-Jun;18(3):190-200. Compounded drugs of value in outpatient hospice and palliative care practice. Nausea & VomitingPersistent nausea can often be effectively controlled by using a combination of medications tailored to meet that individual’s specific needs. Dosage forms include transdermal gels, suppositories, lollipops, and more. Lorazepam, diphenhydramine, haloperidol, and metoclopramide (known in combination as “ABHR”) have been prepared as a rectal suppository and in other transdermal dosage forms. The rationale is to use a variety of medications which target various pathways such as vagal nerve stimulation, the vomiting center, and the CTZ for more severe cases. Researchers at Memorial Sloan-Kettering Cancer Centre have studied the antiemetic activity and safety of the antiemetic regimen of metoclopramide, dexamethasone, and diphenhydramine in patients receiving standard outpatient chemotherapy programs. Vomiting was prevented in over 70% of patients. Oral combination antiemetics in patients with small cell lung cancer receiving cisplatin or cyclophosphamide plus doxorubicin. Intranasal metoclopramide may significantly reduce the frequency of acute vomiting in patients receiving highly emetogenic chemotherapy, such cisplatin-induced delayed emesis. Intranasal metoclopramide caused minor irritation of the nasal membrane and unpleasant taste in some patients, but was otherwise well tolerated, with no report of serious extrapyramidal effects. ABH Transdermal Gel for Chemotherapy-Induced Nausea/VomitingChemotherapy-induced nausea and vomiting (CINV) is commonly cited by patients as being among the “most unpleasant and distressing” side effects associated with chemotherapy. CINV may impair quality of life significantly and necessitate chemotherapeutic dose reductions, treatment delays, and discontinuation of therapy. Finally, it may cause a substantial number of lost work days for patients and considerable costs to the healthcare system, resulting in a substantial economic burden. Bleicher et al. of the Haematology/Oncology Division, Creighton University Medical Centre, Omaha, NE, investigated the efficacy of “ABH,” a topical gel containing lorazepam (Ativan®), diphenhydramine (Benadryl®), and haloperidol (Haldol®), in reducing breakthrough CINV. Adults receiving standard recommended prophylactic antiemetics as outpatients were instructed to apply 0.5 mL of a transdermal gel (containing lorazepam 2 mg, diphenhydramine 25 mg, and haloperidol 2 mg) when they experienced significant CINV. When the severity of CINV was quantified on a scale of 0-10, the mean CINV score decreased significantly from a 6.1 before gel application to a 1.7 as evaluated 30 minutes following gel application. Topical use of ABH gel appears to be a promising and safe rescue therapy for breakthrough CINV that occurs despite prophylactic antiemetic therapy. Weschules noted that of 11,181 ABHR (ABH plus metoclopramide [Reglan®]) prescriptions provided for patients, 6,529 (58.4%) were for a topical gel, and 4,312 (38.6%) were for a rectal suppository. 2 Less than 0.5% of patients discontinued treatment due to adverse side effects. Another retrospective study reported use of an ABHR gel to be 98% effective in hospice patients. 3 There were no adverse reactions; however, problems arose when patients with bowel obstructions were treated. Lorazepam, diphenhydramine, and haloperidol transdermal gel for rescue from chemotherapy-induced nausea/vomiting: results of two pilot trials.Click here to access the PubMed abstract of this article. Tolerability of the compound ABHR in hospice patients. Int J Pharm Compounding 2006;10:95–99. Dry Mouth & StomatitisThere are many factors that can interfere with the ability to eat when a person is receiving chemotherapy. Malnutrition may result, yet it is often preventable. Our pharmacy can compound medications to help combat mouth tenderness and infections, which may enable patients to enjoy eating again. Effect of topical morphine [mouthwash] for mucositis-associated pain following concomitant chemoradiotherapy for head and neck carcinoma. Loss of saliva (xerostomia) is one of the most common complaints among patients who have received radiation therapy of the head and neck. Xerostomia contributes to radiation-induced periodontal infection, dental caries, osteoradionecrosis, and poor digestion of carbohydrates. Ask us about sialogogues (saliva stimulants) in customized dosage forms.The following article discusses the benefits of using pilocarpine in a sustained release dosage form to treat xerostomia. Transdermal Anticholinergics for the Treatment of “Death Rattle” and Excessive SecretionsDifficulty clearing upper airway secretions (death rattle) is a problem for half of all dying patients. Treatment often includes the use of anticholinergic drugs, such as scopolamine (also known as hyoscine) or atropine. Transdermal scopolamine has several indications for symptom control in patients with end-stage disease: control of excess salivary secretions, management of terminal secretions, and control of nausea. Using anti-muscarinic drugs in the management of death rattle: evidence-based guidelines for palliative care. Click here to access the PubMed abstract. Death rattle: prevalence, prevention and treatment. Scopolamine: new preparations. Reference treatment for death rattle. Reduction of salivary flow with transdermal scopolamine: a four-year experience. Drooling is a serious social handicap experienced by some neurologically impaired patients. No one method has been identified to control drooling for all patients, however, anticholinergic drugs have been utilized. In the following case study, transdermal scopolamine was found to be effective for controlling drooling in a traumatic brain-injured patient for whom more conservative methods failed. From a baseline saliva flow rate, saliva flow decreased up to 59%. No significant side effects were observed with treatment, and the decrease in drooling was maintained for a 4-month period. Although transdermal scopolamine may represent one acceptable facet of long-term treatment, it must be stressed that efficacy is variable across patient populations and that treatment approaches must be individualized. The use of transdermal scopolamine to control drooling. A case report. Pain management is essential because, even when the underlying disease process is stable, uncontrolled pain prevents patients from working productively, enjoying recreation, or taking pleasure in their usual roles in the family and society. Chronic pain may have a myriad of causes and perpetuating factors, and therefore can be much more difficult to manage than acute pain, requiring a multidisciplinary approach and customized treatment protocols to meet the specific needs of each patient.Optimal treatment may involve the use of medications that possess pain-relieving properties, including some antidepressants, anticonvulsants, antiarrhythmics, anesthetics, antiviral agents, and NMDA (N-methyl-D-aspartate) antagonists. Palliative care often involves the use of opioid analgesics. NMDA-receptor antagonists, such as dextromethorphan and ketamine, can block pain transmission in dorsal horn spinal neurons, reduce nociception, and decrease tolerance to and the need for opioid analgesics. [Anesth Analg 2001 Mar;92(3):739-44] By combining various agents which utilize different mechanisms to alter the sensation of pain, physicians have found that smaller concentrations of each medication can be used. Topical and transdermal creams and gels can be formulated to provide high local concentrations at the site of application (e.g., NSAIDs for joint pain), for trigger point application (e.g., combinations of medications for neuropathic pain), or in a base that will allow systemic absorption. Side effects associated with oral administration can often be avoided when medications are used topically. Studies suggest that there are no great restrictions on the type of drug that can be incorporated into a properly compounded transdermal gel. When medications are administered transdermally, they are not absorbed through the gastrointestinal system and do not undergo first-pass hepatic metabolism. We work together with prescriber and patient to solve problems by customizing medications that meet the specific needs of each individual. 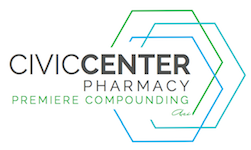 Please contact our compounding pharmacist to discuss the dosage form, strength, and medication or combination that is most appropriate for your patient. J Pain Symptom Manage. 2009 May;37(5):913-7. Effectiveness of topical administration of opioids in palliative care: a systematic review. Per a prescription order, a formulation can be compounded to contain the proper combination of active ingredients, in the most appropriate base, to treat a specific type of wound. We customize medications to meet each individual’s specific needs. For example, the choice of cream, ointment, or gel can be clinically significant. Each time a wound needs to be cleaned, there is the potential for disruption of new tissue growth. Gels, which are more water soluble than creams or ointments, may be preferable for wound use because a gel can be rinsed from the wound by irrigation. Another useful dosage form is the “polyox bandage” – which can be puffed onto a wound and will adhere even if exudate is present. A polyox bandage can be compounded to contain the active ingredient(s) of your choice. Decubitus UlcersPhenytoin has been used topically to speed the healing of decubitus ulcers, pressure sores, venous stasis and diabetic ulcers, traumatic wounds, skin autograft donor sites, and burns. Ketoprofen may be used to control inflammation and pain, lidocaine provides topical anesthesia, and pentoxifylline may improve microcirculation at the wound margins and promote healing of the injured area. Misoprostol, a prostaglandin analog, is often included in wound care formulations to promote healing. Debridement of necrotic eschar with 40% urea paste may also speed healing. Medications which improve capillary blood flow can be added to a compounded medication to enhance circulation at the wound margins and promote healing of the injured area. Topical Phenytoin for Wound HealingPhenytoin may promote wound healing by a number of mechanisms, including stimulation of fibroblast proliferation, facilitation of collagen deposition, glucocorticoid antagonism, and antibacterial activity. Rhodes et al compared the healing of stage II decubitus ulcers with topically applied phenytoin and two other standard topical treatment procedures in 47 patients in a long-term care setting. Ulcers were examined for the presence of healthy granulation tissue, reduction in surface dimensions, and time to healing. Topical phenytoin therapy resulted in a shorter time to complete healing and formation of granulation tissue when compared with DuoDerm dressings or triple antibiotic ointment applications. The mean time to healing in the phenytoin group was 35.3 +/- 14.3 days compared with 51.8 +/- 19.6 and 53.8 +/- 8.5 days for the DuoDerm and triple antibiotic ointment groups, respectively. Healthy granulation tissue in the phenytoin group appeared within 2 to 7 days in all subjects, compared to 6 to 21 days in the standard treatment groups. The phenytoin-treated group showed no detectable serum phenytoin concentrations. Topical phenytoin treatment of stage II decubitus ulcers in the elderly. Role of phenytoin in wound healing–a wound pharmacology perspective. Topical phenytoin in diabetic foot ulcers. Benzoyl Peroxide for Treatment of Decubitus UlcersBenzoyl peroxide is a powerful oxidizing agent with broad spectrum germicidal activity and good liposolubility. Therefore, it may represent a good agent for prevention of wound infection in areas with high density of sebaceous glands. Topical treatment of pressure sore with 20% benzoyl peroxide in O/W emulsion yielded very satisfactory results. In another study, 10% benzoyl peroxide gel was used prophylactically once a day for 7 days before surgery. The researchers concluded that topical benzoyl peroxide is an efficacious, harmless, and inexpensive agent for prevention of wound infections in seborrheic regions. Med Cutan Ibero Lat Am 1988;16(5):427-9. When illness is incurable or the cause is irreversible and the goal is palliation, systemic opioids are the first-line therapy for symptomatic management of dyspnea. Oral morphine as symptomatic treatment of dyspnoea in patients with advanced cancer. N Engl J Med. 1981 Dec 31;305(27):1611-6. Effects of dihydrocodeine, alcohol, and caffeine on breathlessness and exercise tolerance in patients with chronic obstructive lung disease and normal blood gases. EPEC Project, 1999. The Project to Educate Physicians on End-of-life Care from the Institute for Ethics at the American Medical Association. Radiation proctitis is a known complication of radiation therapy for prostate cancer. Commercially available treatments are often ineffective and have focused on relieving symptoms after damage has occurred, although options exist for prevention. A prospective, randomized, placebo-controlled, double-blinded trial concluded that misoprostol rectal suppositories significantly reduce acute and chronic radiation proctitis symptoms in patients receiving radiation therapy for prostate cancer. A prospective randomized placebo-controlled double-blinded pilot study of misoprostol rectal suppositories in the prevention of acute and chronic radiation proctitis symptoms in prostate cancer patients. Seven patients with radiation proctitis completed an open pilot study to evaluate the effectiveness of short chain fatty acid (SCFA) enemas. Four weeks of treatment resulted in clinical improvement in all patients, and modest changes in endoscopic and pathological parameters. Evaluation of short-chain fatty acid enemas: treatment of radiation proctitis. Topical sucralfate may induce a lasting remission in a majority of patients with moderate to severe rectal bleeding due to radiation proctosigmoiditis. Topical morphine is effective in relieving mucositis-associated pain following concomitant chemoradiotherapy in head and neck carcinoma. Three patients, who had been treated previously with oral morphine with no relief from esophagitis pain, swallowed from 2 to 10 mL of 0.1% morphine viscous gel three times a day, 5 to 60 minutes before eating. The gel covered esophageal surfaces and produced topical anesthesia. Benefit continued to increase over several days of use. In prior studies, relief of oral mucositis pain was obtained by a topical 0.1% morphine solution. The major advantages of topical morphine administration are simplicity, low incidence of side effects, and low cost. J Pain Symptom Manage. 2005 Aug;30(2):107-9. Chemoradiotherapy-induced esophagitis pain relieved by topical morphine: three cases. “Mucositis is a common adverse event related to many antineoplastic regimens… Ketamine is a potent N-methyl-D-aspartate (NMDA) receptor channel blocker that can lead to decreased nocioception and inhibit the inflammatory cascade… Also, ketamine acts on a number of other pathways that may attenuate pain.”Ketamine mouthwash (20 mg/5 ml) administered using the “swish and spit” technique may be a viable treatment option in refractory mucositis pain. J Palliat Med. 2009 Nov;12(11):989-91. Systemic doxepin, a tricyclic antidepressant, has been used for pain management of patients with chronic pain. Practitioners at major US universities and in private practice assessed pain reduction after topical doxepin rinse in fifty-one patients with painful oral mucositis attributable solely to cancer therapy. A significant reduction of oral pain was recorded after doxepin was administered. At 5 minutes, on average, patients reported a 41% decrease in pain, and the median duration of pain reduction lasted for almost 2½ hours. Taste was acceptable and discomfort/burning with use was minimal. These findings are in contrast to typical complaints of taste and discomfort/burning associated with topical application of local anesthetics. The following list is just a few of the preparations that we can compound for palliative care. All formulations are customized per prescription to meet the unique needs of each patient. Please call us to discuss the dosage form, medication, and strength which are most appropriate for your patient.